We’d love your help. Let us know what’s wrong with this preview of The Carrying by Ada Limon. Vulnerable, tender, acute, these are serious poems, brave poems, exploring with honesty the ambiguous moment between the rapture of youth and the grace of acceptance. A daughter tends to aging parents. 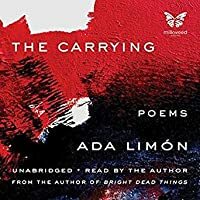 A woman struggles with infertility—“Wh From National Book Award and National Book Critics Circle Award finalist Ada Limón comes The Carrying—her most powerful collection yet. To ask other readers questions about The Carrying, please sign up. Exquisite poems about love, fertility, desire, this natural world we move through, the political climate, so much more. Limón writes intimate short poems structured by narrative and images of nature: the poetry in this collection focuses on fertility, passion, loss, creativity, and, occasionally, politics, all through the lens of the poet's daily life. Pain laces many of the poems, but Limón's outlook is fundamentally optimistic, her work measured and tranquil. The collection's straightforward language and interest in everyday life l My full review, as well as my other thoughts on reading, can be found on my blog. So good. Ada Limon just gets better and better. Just finished up this wonderful collection. Many of the poems here deal with the body and the number of ways it can be an impediment in our lives - illness, infertility, beauty standards we fail to meet, etc. Many also dealt with caring for others - parents, friends, etc. A warm and honest collection about every day living. This collection came on strong in the stretch drive, section 3, which is not to say the earlier parts were without their pleasant parts. There were joys to be found there, too, though it was a bit more uneven than the last section. I've written up a full review and included four poems I especially liked from Part 3 down this rabbit hole. I've said it before and I'll say it again: Ada Limón is my favorite living poet. I love her work because she is realistic without being too pessimistic, an attitude much needed in these trying times. There's always room for hope in her poems. I was eagerly anticipating this new collection, and it did not disappoint. I read it in a single sitting, which hardly ever happens when it comes to my reading. This is a very cohesive collection, expertly laid out. The Carrying doubles down on the theme of connecting to nature from her previous collection, Bright Dead Things, and explores some new territory as well, such as fertility and more overtly political poems. Several poems deal with the male gaze and male violence, and have echoes of #MeToo. There is also a pervasive aesthetic of winter--perhaps a nod to the difficulty of finding joy and beauty when all around us things seem to be getting worse, and the sense of being in survival mode. These are relevant and affirming poems. I was reminded of Rebecca Solnit's book Hope in the Dark: Untold Histories, Wild Possibilities, wherein Solnit argues for the necessity of hope, and points to past political movements for proof that even the seemingly impossible can be made possible through persistence and determined positivity. I was reminded of this book because Limón seems to have a similar ethos of purposefully seeking out hope. “I still worry / and want an endless stream of more, / but some days I can see the point / in growing something, even if it’s / just to say I cared enough.” -from "Trying"
This is Limón's most personal poetry yet, unflinching and frank. She also doesn't shy away from addressing the political mood. Perhaps the standout poem for me in this collection was "A New National Anthem," a subtle nod to the athletes protesting police brutality by kneeling during the playing of the anthem. She points out how unthinking and rote patriotism often is, and how it leaves no room to discuss our ugly history of slavery, war, etc. She suggests an alternative third stanza that invokes a more intentional and inclusive unity. In the following poem, "Cargo," she describes the ways the current administration's immigration policy has affected her sense of security as a Latinx woman and harmed her mental health ("both of our bloods requiring new medication"). I really connected with Limón's quiet rage, especially in poems like "Mastering" and "Sacred Objects." She writes about the anger and mistrust women must carry necessarily. Perhaps all the "good men" in the world should read these poems, and then maybe they would understand why women have trouble trusting "even" them. Limón is writing less from a place of judgment or resistance, and more with an attitude of acceptance--meeting the world where it's at, making good out of the bad. This is a collection about the choices we make to get through the day, the ways we love the people we love, and the words we write to ground us. I hesitate to share too many quotes because I think these poems deserve to be read without prior expectations. So I will close by saying that this collection is great for anyone who has loved Limón's work in the past, anyone feeling too sensitive to bear the world these days, and anyone who wishes Mary Oliver was just a little bit blunter sometimes (haha). Five stars. Ten stars. 100 stars. As a die-hard Ada Limón fan, I have been aching for more of her work since finishing "Bright Dead Things." Now, I think I can say I have a new favorite collection. Unflinching, emotive, selfless, compassionate, full of life and humanity and pain and joy and beauty, Limón has delivered, yet again, a stunning work that left me breathless with every page. Great writer. But kept feeling this is Mary Oliver, slightly updated, both in subject matter and rhythm. More a fan of Bright Dead Things. This won't put me off remaining a fan of Ada, though. Looking forward to her next! “What if, instead of carrying / a child, I am supposed to carry grief?" Beautiful poems about, among other things, pain, grief, fertility, and the idea of mother. i loved this. ada limon writes about loss and grief and politics and small moments of joy, of life, and it feels like the perfect poetry book for right now. there are lines that are absolutely stunning, little pieces of perfection. mostly i'm happy to be in immersed in ada's world with its tragedies and little beauties. I haven't sat and read a poetry collection cover to cover in a long time (since college, since Marie Howe). I need to remedy that because I loved this book so deeply. There's a dark beauty to these poems. They comforted me in a dark time in my life, in a way nothing else has. This was, of course, a beautiful collecting; I think that Bright Dead Things resonated with me more (but it always feels unfair to compare collections between an author) but there were definitely poems in this collection that absolutely took my breath away. I think in this one, I was much more aware of the craft? This isn't a detriment to the poems and their strength, but rather I was just aware of what rhetorical moves were being made, what phrases and turns Limon likes making in her work. That This was, of course, a beautiful collecting; I think that Bright Dead Things resonated with me more (but it always feels unfair to compare collections between an author) but there were definitely poems in this collection that absolutely took my breath away. I think in this one, I was much more aware of the craft? This isn't a detriment to the poems and their strength, but rather I was just aware of what rhetorical moves were being made, what phrases and turns Limon likes making in her work. That doesn't diminish the overall collection, but I didn't have moments where I was like, "Wow, how did she do this?" like I did in other collections of hers. This is the Nitpickiest of Nitpicks: "Wow, this is just TOO well-crafted!!!" Ha. This book is one of the best books of poems I’ve read in a good long while. It’s one I plan to return to again and again. It’s one of those books that make you think about the world, yourself a little differently, a little harder. I didn’t connect much with the first half of this book but the second half is riddled with dog-eared pages. Reading again immediately. Ada Limon is rapidly becoming my favorite poet. What gorgeous poems! Every poem in this book gleams with quiet, ferocious brilliance. The lines stay inside me after the pages are turned and I am comforted by their existence. The reason Ada Limon is one of my favorite modern poets is that she captures a higher purpose in living through the most ordinary images -- a dog leash, a tomato plant, etc. I will read this book again and again. This one's not for me. I'd prefer the poems with the last 2 or 3 lines cut. Such tidy little wrapped up endings, often written in a way to seem more profound than they really are. As with Bright Dead Things, I'm blown away by Ada Limon. She writes that edge of hope and sadness and it cuts so well. There's always a sense of optimism, of rebirth, that life goes on, that the wheel keeps on turning. This is something to have on your shelf when you need a moment to just think of things bigger than yourself. Moving, clear-eyed poems about the strangeness of love, the letdowns of the body, and the small moments of joy that keep us going. Also a line about ghosts that made me cackle last night. Limón is a national treasure. It might sound trite, but (I'm no poet!) these poems are vulnerable, brave, and intimate, just like the blurb says. They acknowledge how crappy life can be, especially right now maybe, and they finish with a message of hope, even if that hope is difficult to grasp it's there. by the mud puddle and the musk thistle. to the question my curving figure made. on thorns and liking it. I'd love to figure out what makes me love a list, because there are so many I reject as too contrived, too MFA-exercise-turned-into-a-novel-or-poem-or-whatever. But some lists hit me just right, and I can't tell what makes the difference. Why do I love Sei Shonagon's but hate Emily St. John Mandel's? Why do I love Italo Calvino's lists but hate Tim O'Brien's? Ada Limon writes lists I can love. The much loved loose forest-green sweatpants, the long bra-less days, hair knotted and uncivilized, a shad I'd love to figure out what makes me love a list, because there are so many I reject as too contrived, too MFA-exercise-turned-into-a-novel-or-poem-or-whatever. The much loved loose forest-green sweatpants, the long bra-less days, hair knotted and uncivilized, a shadowed brow where the devilish thoughts do their hoofed dance on the brain. Black bark, slick yellow leaves, a kind of stillness that feels so mute it's almost in another year. Her poems are evocative and lyrical and also accessible. I mostly know what she's talking about. There's just the right balance between mystery and meaning. When Eve walked among the animals and named them—nightingale, red-shouldered hawk, fiddler crab, fallow deer—I wonder if she ever wanted them to speak back, looked into their wide wonderful eyes and whispered, Name me, name me. Once when I was young, we camped out at Russian Gulch and learned the names of all the grasses, the tide pool animals, the creatures of the redwoods, properly identifying seemed more important than science, more like creation. With each new name, the world expanded. I give names to everything now because it makes me feel useful.